"To live is to suffer, to survive is to find some meaning in the suffering." In this fifth volume of the Grieve Project, our award winning writers and poets share their often heartbreaking, but always uplifting stories of grief and loss, not only for their own catharsis, but so those newly grieving can feel a little less alone. As with all volumes, Grieve Volume 5 contains many perspectives on grief and loss - from the tragedy of losing an unborn child to the loss of parents, spouses and siblings at the end of a long life. Now entering its 6th year, the Grieve Project has grown from a humble Australian writing competition run in honor of Grief Awareness Month into a truly international project. We will all experience grief and loss in our lifetimes; they transcend nationality, philosophy and religion. Most of the writers in Grieve believe sharing their stories has brought them greater peace and helped the grieving process. It is our profound wish that you too can find hope and healing through their stories. Cathartic. In writing their story of grieving, they write for us. These short stories require no effort or commitment on behalf of the reader; they simply flow. The authors have crafted information and emotions that somehow unite us all in feeling our 'human-ness'. Thank you to both the authors and 'The Hunter Writers Centre' for your talent and your passion. A privilege to read. 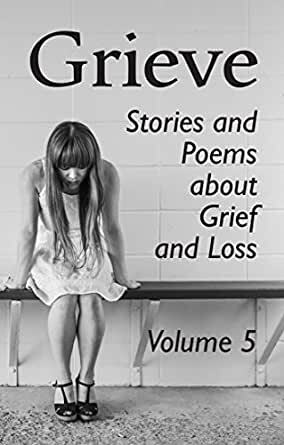 Grieve Vol 5 is an honest and emotive collection of tales of loss. From the simpleworde to longer stories,Grieve reminds us that life can be stolen silently and we all need to appreciate the relationships we have today in order to remember the relationships that live with us in our tomorrows. As with the previous volumes, this anthology contains pieces that can't help but move. For me, I've found hope in reading stories of other's grief and know that I'm not alone in mine. I highly recommend the purchase of this anthology. A varied and powerful collection. Not light reading but speaks to those times when it's good to have a companion in the struggle. Heart-wrenching - I gulp for air as the memories come flooding back. The power of language to rekindle emotion thought hidden! Sad stories, but not depressingly sad. Many were uplifting.